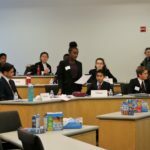 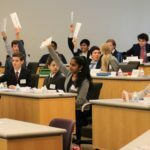 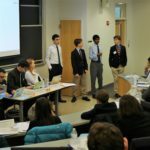 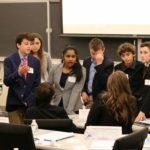 The Sage School Model United Nations Team attended the Middle School MUN Conference November 17 hosted at Northeastern University. 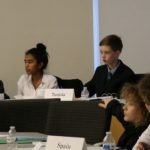 There were 36 school delegations in attendance with over 600 student delegates, who worked together to resolve dynamic global issues spanning topics such as access to renewable energy and clean water, food security, child soldiers and cybercrime. 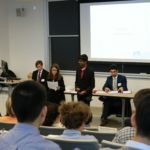 Leading up to the event, Sage students worked to prepare for the conference by writing speeches, creating position papers and practicing parliamentary procedures. 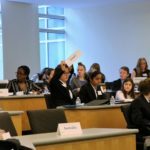 Representing various nations from around the globe, our Sage students worked diligently to pass resolutions at the global level. 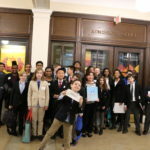 MUN Advisor, Patrick McManus, along with Sage parent, Tushar Misra, accompanied students at the conference. 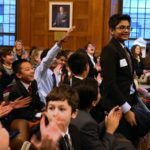 Sage alums, Oscar Capraro ‘18 and Priya Rajaram ‘17, also helped lead the event, with Oscar chairing one of the committees and Priya assisting with chaperoning our Sage MUNers throughout the day.